Guess it was only a matter of time till one gives way to purchasing a quartz. As much as I prefer mechanical pieces, ultimately the temptation was too great and I folded from the thought that it being current issued timepiece. 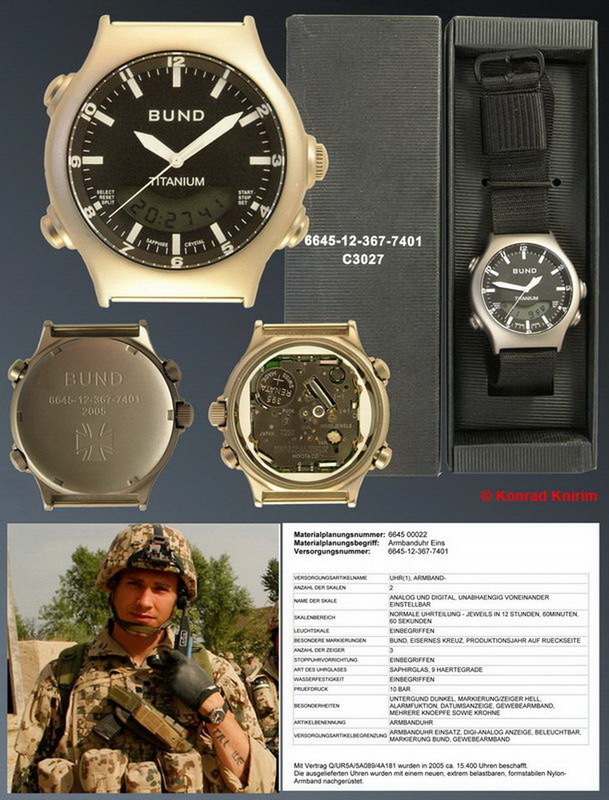 For those who are not familiar with this one, its a Bundeswehr (BUND) issued Tutima/Boccia 728-07 with Miyota movement. In use by German Expeditionary forces in Afghanistan. Insert of Konrad Knirim page was borrowed from his post on MWR. I'm with you on quartz watches though. I've bought a few latterly (Heuer 1000m, Technos Sky Dive, Citizen 800m A'land, Seiko Ashtray), but they're not really my thing. We'll see how they come up in the next few months. I've considered that one myself - I'll be interested to see how you like it, Dan. As for quartz watches, I have a few which I have seen described as "honourary mechanicals" - RAF Seiko Gens 1 and 2, CWC SBS and NVA Ruhla (subject of another post here http://forum.atgvintagewatches.com/s...ead.php?t=2249). Really nothing fascinating about some modern milwatches. Guess one cant expect the quality or the type of movement from the likes of a cal. 89 or 488 / Sbr. Those days are long gone.